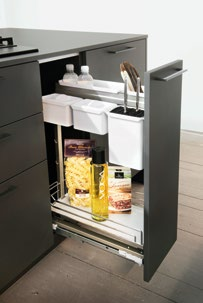 The doors on a contemporary kitchen are flat and lines are sleek, this is achieved by integrating appliances. Each unit is made from scratch and we can have special units built to suit a particular space or purpose. Various storage options are available so that everything is put away and the clean lines continue. Extend your living space by drawing your dining into your kitchen by creating an island or peninsular with seating or, use as a separation between the two rooms. Why not use a mix of nature and metal tones to compliment each other.